It seems that Ahmed Mohamed—the young Muslim teen who was arrested at his school over a homemade clock mistaken for a bomb—will not be getting any justice in his case. A federal judge has tossed out a lawsuit that was filed against the Irving, Texas, Independent School District and the city of Irving. That charge was later dropped, but not before the case drew a flurry of protests. 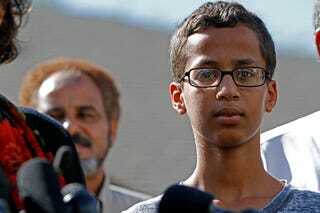 Ahmed’s name became widely recognized as the 14-year-old made headlines. The lawsuit—which named the Irving Independent School District, the city of Irving and MacArthur’s principal as defendants—was based on the Equal Protection Clause of the U.S. Constitution and Title VI of the Civil Rights Act of 1964. However, on Thursday, U.S. District Judge Sam A. Lindsay agreed with the city and school district’s motions to dismiss the lawsuit on the grounds that there was no evidence that Ahmed had faced religious or racial discrimination. “Plaintiff does not allege any facts from which this court can reasonably infer that any [Irving Independent School District] employee intentionally discriminated against A.M. based on his race or religion,” the judge wrote in his ruling. The judge also ruled that the lawsuit failed to prove that the arrest violated Ahmed’s Fourth Amendment rights against unreasonable search and seizure. “Plaintiff fails to allege a policy, custom or practice of the city that was the moving force of an alleged constitutional violation,” Lindsay declared. Lindsay said that MacArthur High School Principal Daniel Cummings was looking out for the safety of the other students when he and a local police officer removed Ahmed from the classroom, brushing off questions in the suit that questioned Cummings’ motives. “On the one hand, by not taking action, he is faced with the gruesome prospect of death or serious injury of persons had the device actually been a bomb and exploded; and, on the other hand, he is faced with a federal lawsuit for denial of a student’s constitutional rights because the device turned out not to be a bomb,” he added. Ahmed’s family moved to Qatar following the incident.